Architect Ross Barney designed this library building. It was completed in 2008. 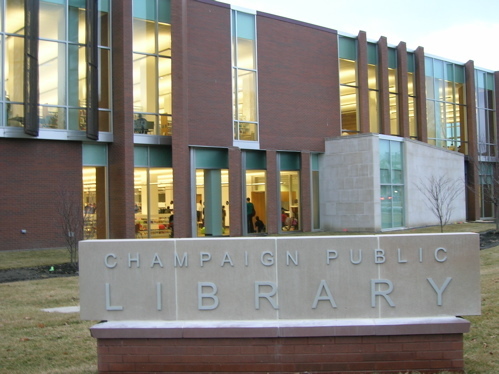 The first Champaign Public Library was opened in 1876 and there have been six facilities up until the current location. The need for a new library came from budget cutbacks during construction of the most recent library in 1978. From then on, the collection of the library has been doubled and the facilities limited the library’s ability to serve the users. Therefore, the new Champaign Public Library was designed and built to respond to the need of a high tech library for the community. Construction on the new Champaign Public Library began in the fall of 2005 and it was opened on January 6, 2008. Ross Barney, graduated from University of Illinois, and her fellow architects designed Champaign Public Library for city of Champaign. The design works within constraints of a small site, maintaining building operations throughout construction and a tight budget. Ross Barney’s design of a modern library with different facades for each orientation makes Champaign Public Library an environmentally friendly architecture in the downtown area. 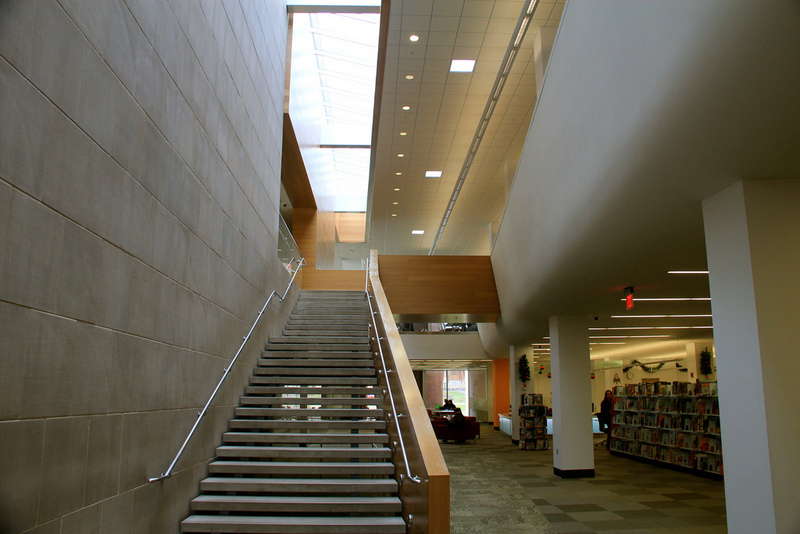 In 2009, Champaign Public Library won the AIA Chicago awards for Design Excellence and Honor award for interior architecture. Ross Barney and her colleagues had worked on this project for nine years to come up with a design of a modern library that not only fulfills the government’s requests but also satisfies the needs of local residents. Key design factors were vehicular access, proximity to Green Street, and forming the building around other buildings in the area. During the design process, many different designs were conceptualized. The design team used classic midwestern materials such as brick, limestone and copper to give it a Champaign feel that would distinctly set it apart from the university. The façade’s on this building make it stand out and they were designed based on the theory that each one react to its orientation. The need for large amounts of air conditioning contributed to this design concept by allowing for significant day-lighting on some sides and blocking solar energy on others. They also wanted to push an environmentally friendly building by providing abundant natural light, efficient glass, high efficiency HVAC systems, sensors to turn on lights only when needed, many trees in the parking lot to reduce heat island effect, and a white roof to reduce need for air conditioning. While adding comfortable seating and various other improvements the library also features a drive-up book return, an enclosed quiet study room, five group study rooms, the Nate & Lillie Story Room, and the Dodds Family TeenSpace. Champaign’s new library has two stories for public use, plus a partial third floor with staff areas. It sits atop a lower level with a used book store, plus room for future expansion. 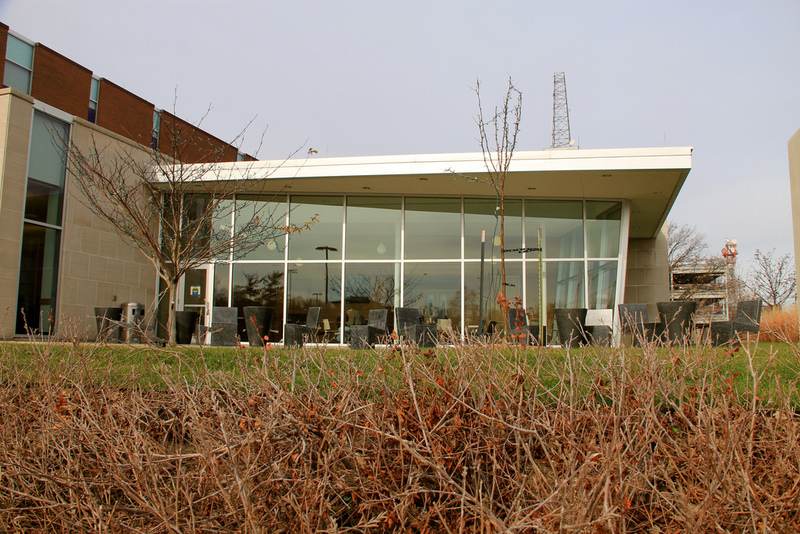 At the east end of the building is the Robeson Pavilion with three meeting spaces and the Latte Da! Cafe and patio. Carol Ross Barney FAIA is founder and Principal of Ross Barney Architects. She is a graduate of the University of Illinois at Urbana Champaign. Following graduation, she served as a U.S. Peace Corps volunteer in Costa Rica planning national parks. She currently teaches an advanced Design Studio at IIT. Her building designs have received numerous honors including 4 Institute Honor Awards from the American Institute of Architects and over 30 AIA Chicago Design Awards. Her firm has received significant sustainable building awards including two AIA COTE Top Ten Green Project awards, and the Evergreen Award from EcoStructure magazine. 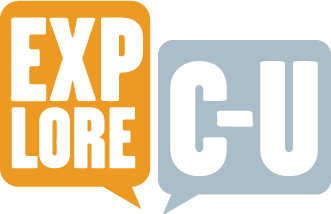 Elliot Smith, Chun Wang, and Xiaosheng Wu, “Champaign Public Library,” ExploreCU, accessed April 21, 2019, https://explorecu.org/items/show/300.